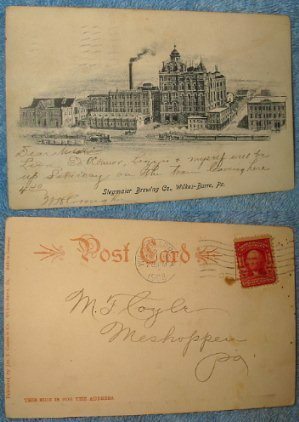 Factory Postcard – Stegmaier Brewing Co. factory scene postcard that is postmarked 1908. Very scarce, early postcard made in Germany. The card is slightly off white, not yellow toned as it appears in the photo. Used, stamped and postmarked with sender message written on the front. Other than color, the photo shows the condition well. No tears or creases.